This dish helps Olivia get her cooking groove back in LUSCIOUS. It is rich and velvety, laced with almond, Amaretto and star anise. My students at Erie Community College were a big help during the recipe testing process, when I kept forgetting to write down the ingredients! If you don’t have a propane torch at home, this custard would also be great sprinkled with granola or sugared almonds. Happy Pumpkins! Preheat oven to 325. Find 12 ramekins or shallow bake-proof molds. Find a pan with sides. It must be large enough to hold the ramekins so you can make a water bath. In a medium saucepan, whisk heavy cream, pumpkin, half of the sugar and the salt. Add the star anise and bring to a simmer, stirring occasionally. Turn off the heat, cover and let sit at least 15 minutes. In a medium bowl, whisk eggs, yolks and the rest of the sugar. Temper the hot mixture into the egg mixture by adding a cup of so of hot liquid to the bowl and whisking. Add remaining hot mixture to bowl. Whisk in Amaretto and almond extract. When the custards are done baking, let them cool slightly. Then remove them from the water bath and let them cool the rest of the way. Put them in the fridge overnight to chill completely. 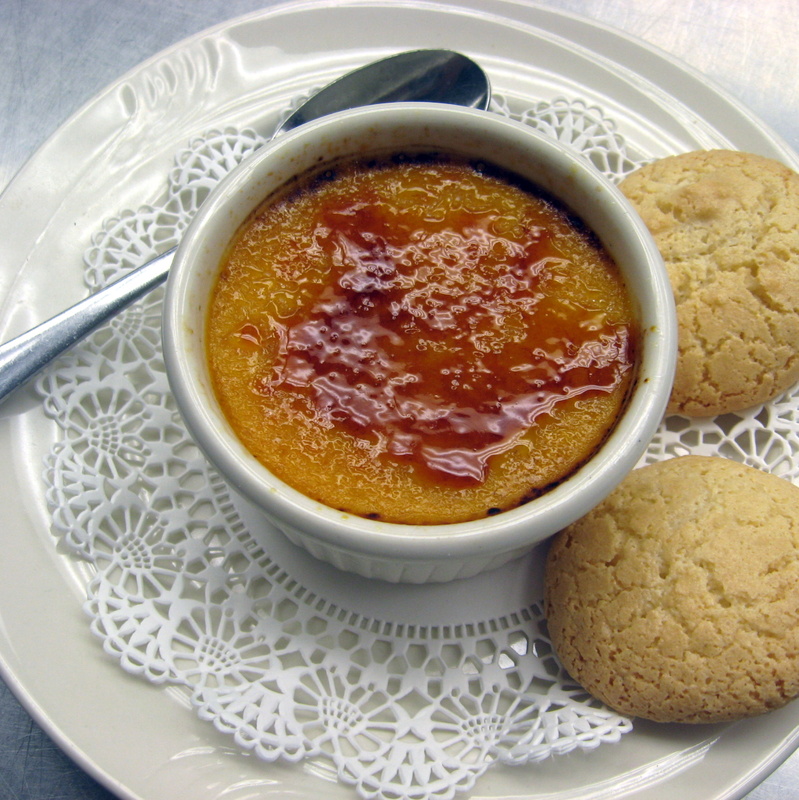 To brulee them, sprinkle an even 1/8 inch layer of sugar over the top and use a propane torch to melt the sugar. Add more sugar and torch again, if needed. Be careful not to hold the torch on one section of the custard too long or you will scramble it. Also – do not get any hot sugar on your hand! HOT! HOT! HOT! Alternately, toss some sliced raw almonds with a little egg white and sugar and bake until toasty brown. Put that on top of the custard to add some delightful texture. Or put granola or streusel on top. Mmmmm. Pumpkin!